Leeds Rhinos began their defence of the Super League title with a hard-fought win against Hull FC, who lost captain Gareth Ellis in the warm-up. Six tries, including five in the second period, overpowered a Hull side who were level 6-6 at half-time. Kevin Sinfield's try and goal for Leeds was cancelled out by Joe Arundel's score, converted by Daniel Holdsworth. Joel Moon, Jamie Peacock, Chris Clarkson, Danny McGuire and Ryan Hall went over for Leeds after the break. Ellis, a winter signing from Wests Tigers, missed the chance to take on his former club after he suffered a foot injury prior to kick-off. Kevin Sinfield's 16 point haul takes him over the required 3,445 points tally recorded by Welshman utility back Lewis Jones between 1952 and 1964. The Rhinos skipper was on 3,440 before the match. His next target is Halifax's evergreen centre Mick Nanyn on 3,545. The loss of Ellis, a major import for the visitors, forced a reshuffle from coach Peter Gentle, with Richard Whiting stepping into the second row and Chris Green on to the bench. Gentle's side featured five new faces, including a new half-back partner for Brett Seymour in former Salford playmaker Holdsworth, and two signings from rivals Hull KR in Shannon McDonnell and Ben Galea. In contrast Brian McDermott, named two of his off-season additions among the starting line-up in Joe Vickery and Moon, who rewarded the faith place in him with an inspiring display. It appeared the continuity within the Rhinos side had paid off when Sinfield added his first points of the season after a scruffy opening period. McGuire popped a harmless looking grubber through that McDonnell and Galea failed to deal with and the 2012 Golden Boot winner dropped on to the loose ball to score. Those resulting points from the successful kick took him past fellow Loiners hero Lewis Jones into eighth place on the all-time point-scorers list. It appeared the champions would swamp their pretenders to the throne with Carl Ablett and Moon forging a threat on the left, but Hull responded with a try of their own through Arundel. Aaron Heremaia's slippery run from a penalty for interference gave the Airlie Birds field position, and Joe Westerman's cute offload close to the line put in the former Castleford centre for a simple score. The breathless end to the first half produced no further scoring, and Seymour was inches away from putting Hull ahead within the first minutes of the second. 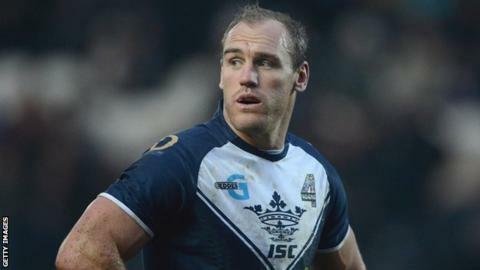 Hull FC coach Peter Gentle on Gareth Ellis: "He'll go for a scan and an X-ray and take it from there. We could have probably needled it and risked him, but this early in the season there is no point doing that." Leeds coach Brian McDermott on Joe Vickery: "I don't think it's good. He's not moving about very freely." Hull's Heremaia just missed out on a 40-20 after referee Steve Ganson adjudged his foot was on the line, while Jason Crookes stopped McGuire in his tracks just 20 metres from the whitewash. The game was in the balance as both sides pushed for a breakthrough, but Leeds showed the experience and quality to ease ahead. Firstly Sinfield picked out the lively Moon to spin his way through the Hull defence to crash over for his debut score, and then a terrific step from Peacock saw him drive over to hand the hosts a two-try cushion. With Hull deflated, Clarkson profited from McGuire's well-timed pass to run in unopposed, and the provider turned scorer when he picked up an inside ball from Sinfield to slip over for his first of the campaign. Hall completed the rout with a typical romp down the left, the conversion again clipped over by Sinfield. "It was a tough one to start with and we knew it would be. For 60 minutes it could have gone either way. Although it was 6-6 at half-time, I thought we were the more dominant team. "I thought we were very good. They lost Gaz Ellis and it obviously affected them. As the end went on, our strike had a bearing on the game. "You can't reach that level every week but you can maintain that effort." "It started bad and got worse. It's tough losing your leader like that but we're not going to use that as an excuse. At 6-6 I thought we were going OK but we fell apart in that second half. "We started playing like individuals when Leeds went up a gear. It's a massive reality check for us, it shows how far we're off the top teams in this competition. "We've a lot of work to do but I still believe we can get there. I don't think that's a fair indication of what we can do."